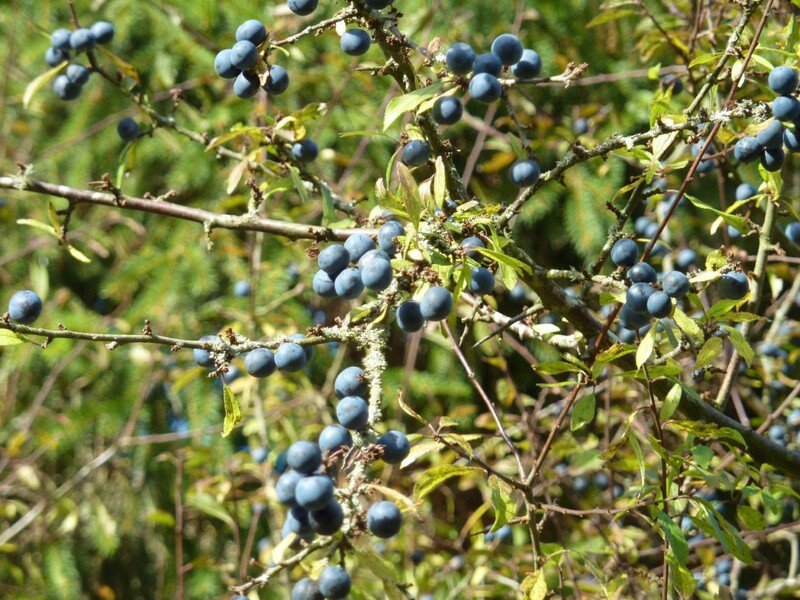 Sloes are at their best during October to mid-November, especially after a frost. There are good years and bad years, so make extra when the sloes are heavy on the bush. Sloes are small, and picking takes a bit of time, so it is easier when there are lots on the branches. The principle is that a bottle or jar is half-filled with sloes, the same weight of sugar is added, and the bottle is topped up with gin. It is best to use a litre bottle, one that has had better-quality fruit juice or the likes. You can use ordinary bottles, but it is fiddly getting the sloes in through the narrow neck. Most recipes say that you should prick all the sloes with a needle or fork, but I couldn’t be bothered and it still tastes good. Putting the sloes overnight in the freezer is as good a method as any to allow the sloes to release their juices. You can either half fill the jar with sloes, empty them into a weighing scale and measure the same weight of sugar, or else estimate the amount of sugar by volume at a ratio of 3:2, ie. 300 mls of sloes is the weight equivalent of 200 mls of sugar. If you don’t want it too sweet, use a ratio of 4:3 sloes to sugar. An example recipe is: 500g/1lb sloes, 750ml/1.5 pints gin, 340g/12 oz sugar. When it is all back in the bottle/jar, top up to the brim with gin, put the top on and shake. The bottle should be stored in a dark place and regularly taken out to shake until the sugar has completely dissolved. There is no fermentation involved, just a subtle blending of flavours and sweetness, so the result after a couple of months ( for it shouldn’t be touched until Christmas at least) is a gorgeous pink liquer. I like to drink it like a hot toddy, with about 50% boiling water, otherwise it is a bit too sweet for my liking. Some people like to strain the finished product into bottles, but I like to have a couple of the preserved sloes in the bottom of the glass for a little nibble.